Did you know that 69% of all emergency responders are VOLUNTEERS? This saves localities across the nation $140 billion each year. 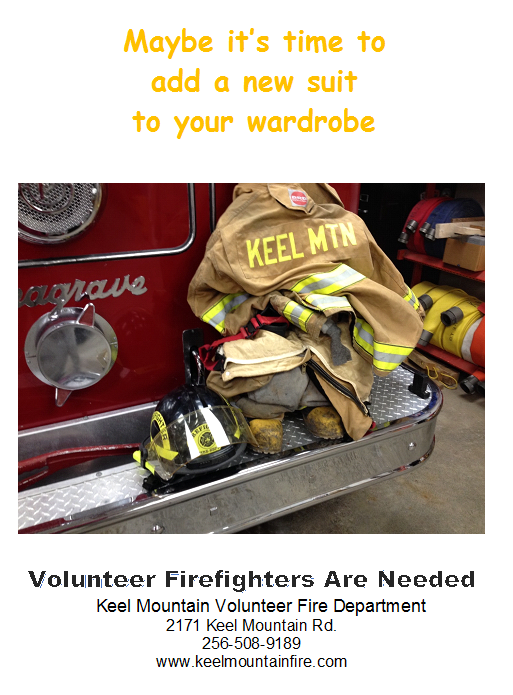 Yet over the last 30 years, the number of volunteer firefighters has declined, while call volume continues to increase. Fill out an application today, it's the toughest job you'll ever love. To assist in meeting regional air quality standards the Alabama Department of Environmental Management (ADEM) implements summer open burning bans from May 1st thru October 31st in twelve Alabama counties: Baldwin, DeKalb, Etowah, Jefferson, Lawrence, Madison, Mobile, Montgomery, Morgan, Shelby, Russell and Talladega Counties.